Did you juggle too many projects, priorities, and performances in 2008? Were you busy simultaneously talking with a colleague, thinking about the next meeting, and listening to email messages bleep continuously into your blackberry? At the end of the day, did you touch all the bases without ever getting down to the basics, getting the most from just one of the bases, or hitting a home run? Do you have what it takes in 2009 to engage the one ball? I believe we don’t need to keep so many balls in the air simultaneously and get flustered as they whiz around or get frustrated when one drops and rolls away from us and we drop all the balls as we lose our focus and concentration. Engage with the one ball. The one ball is a metaphor and method to limit our engagement yet to maximize our performance. It is through a single focus that we may maximize not only our engagement but also our results. If you have a ball close at hand, pick it up and juggle it for a while and notice how easy it can be when we juggle one ball. The genesis of the one ball was watching rhythmic gymnasts perform their ball routine. They use such techniques as: catch, hold on, grab, roll, balance, rhythm, movement, and dance. What do you need to catch? How will you hold on and also let go? How will you roll with your one ball in 2009? How will you maintain dynamic balance and not try to juggle so much by bringing more balls into your routine? What rhythm do you need to maintain to optimize your performance? What kind of movement will we see from you by the end of 2009? How will you dance and enjoy your work with the one ball? Can you become a top performer with your one ball? Watch the following video. As you watch Anna Bessonova work with one ball, imagine what your one ball is and how you could work with it more effectively in 2009. Observe all the ways Anna works with the ball and begin to consider how you could maximize your performance with the one ball. If the video fails to open in this window, click here. What is your one ball? How easy is it to determine your one ball? What balls do you need to set aside or let go of to focus on the one ball? What can you do to sustain your focus on the one ball? Can other people you work with state with clarity and certainty what your one ball is? Can you transform your engagement with the the one ball into a performance art? As 2009 unfolds, I encourage you to have a ball! By the way, The One Ball does not mean that there is only one thing in your life or only one thing that is important. Rhythmic gymnastics have more routines than just the ball routine. We are multidimensional not uni dimensional beings. It can be very productive to have one major focus and to keep a focus on only one ball at a time. Watch for future ONE BALL posts on: performance, effort, focus, play, Kaizen, bounce, catch, throw, etc. THE ONE BALL will be a regular weekly or biweekly feature of Employee Engagement Zingers to help you develop an exceptional level of engaged performance. 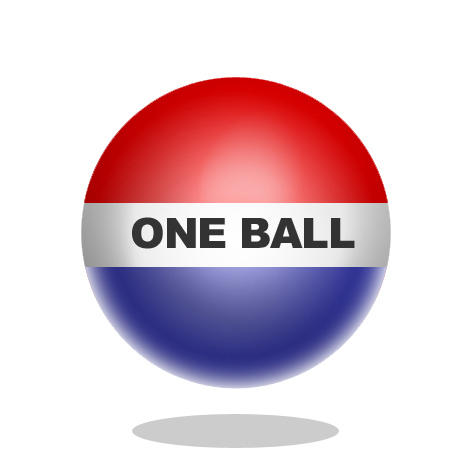 The One Ball images were created by Mr. John Junson. I really like the one ball metaphor — it’s simple to latch on to and it paints the right picture. All the best with the one ball of freelance work. I have been a freelancer/independent consultant/educator for over 25 years and love it. Thanks for latching on and seeing the paint. Much more to come. A very important post, David. Far too much has been made of multi-tasking. We’re always only doing one thing at a time. We may trade-off, but no matter how much we do that, nor how fast we move, it’s one thing. The one ball concept is particularly important because the Internet actually encourages fractured thinking and distraction. Focus gets us much further. Depth and intensity such as Anna displays in her routine are attributes I’m going for in 2009. Thanks! You’ve highlighted a metaphor that is unbelievably “sticky” and creates a mental picture that won’t go away. I am glad you found the One Ball metaphor sticky and still hope you can toss the ball! I don’t think there is much new to say but there are new ways to say things.